The Vatican wanted to commemorate Pope Francis’ first year of reign with a medal. The Italian State Mint created and minted a few thousand medals in gold, silver and bronze for purchase. The medals feature the Pontiff’s coat of arms and motto and went on sale on October8, 2013. 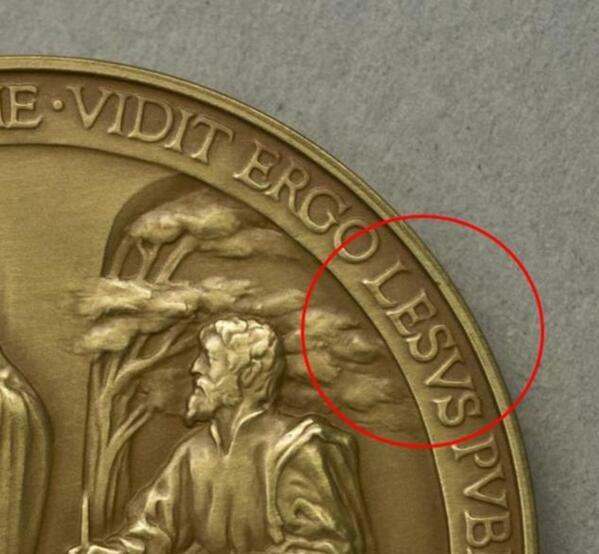 Soon after, it was noticed that “Jesus” was misspelled as “Lesus” in Pope Francis’ motto. Once the typo was detected, Vatican officials quickly recalled thousands of medals slated for sale. However, four of the “flawed” medals were already snapped up by collectors before the embarrassing mistake was detected, which makes their value soar. According to Francesco Santarossa, a coin and stamp shop owner close to St. Peter’s Square, no such a mistake has ever happened before in the 600-year-long history of papal medals. In the current social media age, puns like “Lesus” Christ. “I blame the Lesuits” quickly made the rounds on Twitter. Moral of the story: also the Vatican needs a good proofreader! Quod est demonstrandum! Photographer Nick Brandt released his latest book Across the Ravaged Land. 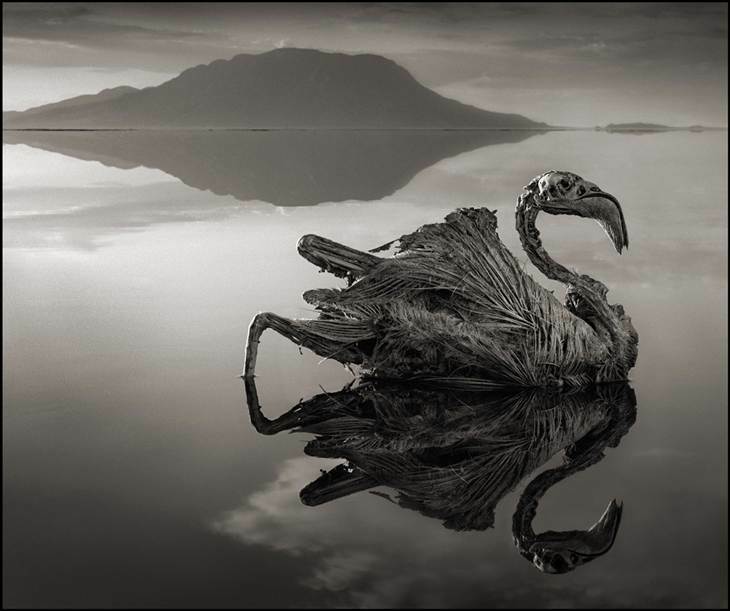 It features haunting photos of a deceptively still body of water in Tanzania with holds a deadly secret, Due to its unique chemical makeup, it turns any animal it touches to stone. Brandt captures the petrified creatures on camera. The whole area around the lake petrifies animals due to its constant pH of 9 to 10.5, which is an extremely basic alkalinity that preserves these creatures for eternity. “I unexpectedly found the creatures – all manner of birds and bats – washed up along the shoreline ofLake Natron in Northern Tanzania. No-one knows for certain exactly how they die, but it appears that the extreme reflective nature of the lake’s surface confuses them, and like birds crashing into plate glass windows, they crash into the lake. The water has an extremely high soda and salt content, so high that it would strip the ink off my Kodak film boxes within a few seconds. The soda and salt causes the creatures to calcify, perfectly preserved, as they dry. The haunting images look like stills from a horror movie or a Dr. Who/Warehouse 13 episode. But the poor creatures featuring in Brandt’s book are (too) real, and it is therefore strongly recommended to stay away from the real thing….and whatever you do – don’t touch it!